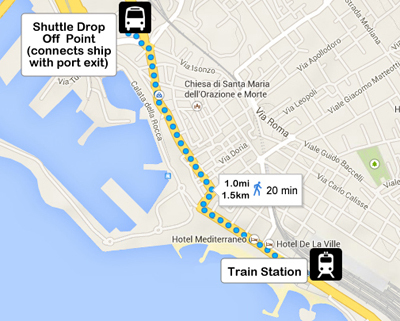 There are three possible ways to travel between Rome and Civitavecchia: train, bus, or private car. 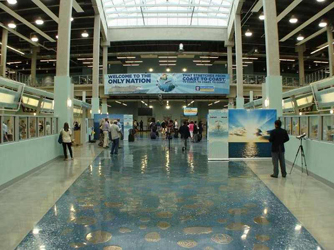 Royal Caribbean offers a direct bus Transfer from the Airport to the Cruise Terminal for $95 per person one-way. This is the simplest way to get to the Terminal. Phone Adele at 760-230-5624 to book the Transfer. If you book a hotel for the night of October 15, 2017 (including earlier nights, if applicable) through Royal Caribbean Cruise Line, the transfer from Airport to Hotel and from Hotel to Cruise Port is included in the Hotel rate. Phone Adele at 760-230-5624 to book the Hotel. If you book a hotel for the night of October 25, 2017 (including later nights, if applicable) through Royal Caribbean Cruise Line, the transfer from Cruise Port to Hotel and Hotel to Airport is included in the Hotel rate. Phone Adele at 760-230-5624 to book the Hotel. 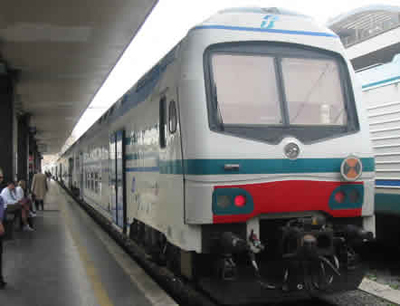 There are a few fast InterCity trains between Roma Termini and Civitavecchia, costing Euros 9,50 in second class and Euros 12,50 in first class and stopping only at Ostiense between Termini and Civitavecchia. There is one of these trains suitable for day-trip cruise passengers which leaves Civitavecchia at 09:19, but no other fast morning fast trains in that direction. There are also a few Frecciabianca trains which cost Euros 13,50 in second class or Euros 19,00 in first class. These trains do not stop at other stations in Rome. All seats on InterCity and Frecciabianca trains must be reserved in advance, which can be done here. The seat reservation is included in the cost of the ticket. The journey on an express train takes 45 to 50 minutes. The BIRG ticket is not valid on these trains. Private train service introduced in 2011 for cruise travelers. The service is intended to provide a secure direct transfer to the Vatican Station (S. Pietro). Not available every day, it is supplemented with the Bus return transfer service which runs more regularly (see below). For schedule and booking of the Fast Track Vatican Express Train see HERE. For all train times see Trenitalia: http://www.trenitalia.com/tcom-en, but note that costs of the local trains are not shown more than 7 days ahead. There is also an unofficial web site where timetables are conveniently made available as printable PDFs for you to bring on travel: http://traintorome.maxonthenet.altervista.org. The same web site also contains other useful information for train travelers, such as an at-a-glance overview of current train delays. 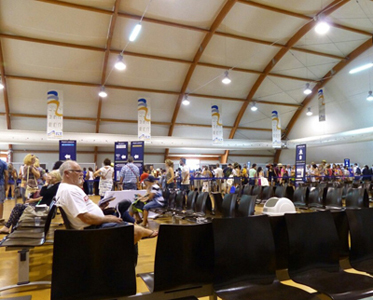 If you leave from Civitavecchia, allow an adequate amount of time to buy your train tickets: the station is small and has not so many counters or vending machines, so you are likely to have to queue before getting your ticket. For cruise passengers, you can pick up the shuttle provided by the cruise line from ship to the North gate (a long walk otherwise). The North gate is about one mile from the train station. Walk time is approximately 30 minutes. There is also a city bus that runs every 20 minutes. People should allocate about 45 minutes to go from the ship to the train station and vice versa. The train station can also be reached by taxi. By Bus (from Euros 19.00 per person) - Service offered with a return on time guarantee, departs and returns from the Port. Travel time approximately 90 minutes each way. Standard departure 09:30 am, other departures available for ships that arrive at different times. 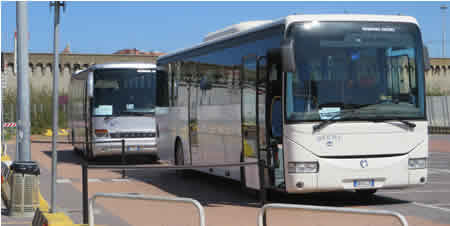 For schedule and booking of the Port to Rome return bus see HERE. There are a number of companies that provide this service. Two companies that are highly recommended: http://romecabs.com and http://romeshuttlelimousine.com. There are few options: by private transfer or taxi, train, or bus. Travel time approximately 50 min. There are several good companies that provide this service. 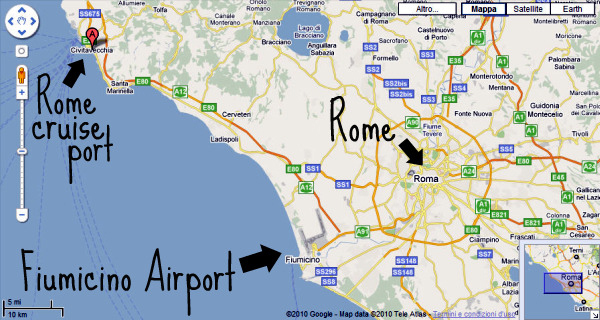 Search in Rome or Civitavecchia forums for comments about a company before booking (read more above). 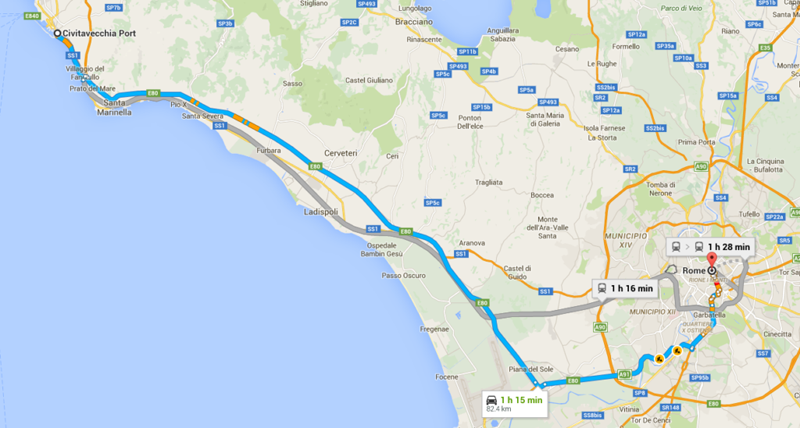 When traveling from FCO to Civitavecchia, an official Rome taxi should have a fixed price of Euros 120. Once inside the port, signage posted throughout will direct guests to their assigned terminal. Parking facilities are available near the cruise terminals starting at a cost of Euros 60 EUR for a seven day cruise plus Euros 12 EUR for each additional day (price subject to change without notice) for the duration of your cruise. The parking facility will only accept Euros on arrival and will not accept credit cards or checks. The parking facility is located inside the port area. The parking facility does not offer a shuttle service to the cruise terminal. Based on availability, guests can pay for a taxi to transfer to and from the pier terminal. Travel time approximately 50 min. Direct transfer from Port to FCO Airport or from FCO Airport to port. Travel time approximately 50 min. Departs from port at 09:30 am, arrives at FCO by 10:30 am. Departs from Airport at 11:30 am arrives at port by 12:30 pm. Not available every day. 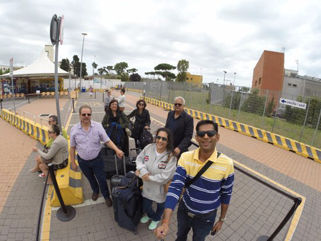 Schedule and online booking for the Civitavecchia-FCO bus transfer found HERE. Travel time approximately 2 hours. 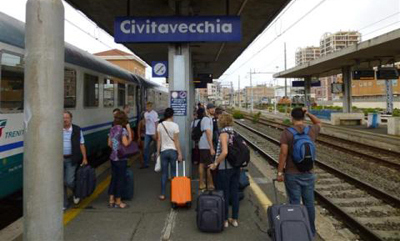 Take the FR1 suburban train (not the Leonardo Express) from FCO towards Rome and get off at the Trastevere station, where you can change to a local train to Civitavecchia. Reverse if going in the opposite direction. Requires some walking with luggage, changing trains, and very likely going up and down flights of stairs at station. Not before 11:00 am October 16, 2017. If you arrive too early, then you will be waiting on the dock, and that is not fun. You need to be aboard the ship by 2:00 pm, an our first Seminar-at-Sea meeting will be at 5:00 pm. The ship will sail at 5:00 pm, so get there well ahead of time. Guests arriving after 3:00 pm may not be permitted to sail. There are government regulations in some ports that require cruise lines to submit a departure manifest 90 minutes prior to sailing. Make sure you keep one bag that you hand-carry onto the ship. Upon arrival at the dock, your luggage will be transfered onto the ship by porters and delivered to your stateroom, and you will not see it again for several hours. You might not see that luggage until late that night. Therefore, pack a carry-on that you can wheel onto the ship with all you need for the day, including your travel documents, change of clothing, swim suit, workout clothes, cosmetics, medicines, book to read, and/or anything else you might want. Give your checked bags to one of the porters upon your arrival at the dock. Make sure your luggage tags are securely attached to your luggage so they will arrive in your stateroom. (Print out those luggage tags in advance from the Royal Caribbean website when you complete your online check-in.) Gratuities for porters are not included in your cruise fees. A suggested tip is $3 per bag. 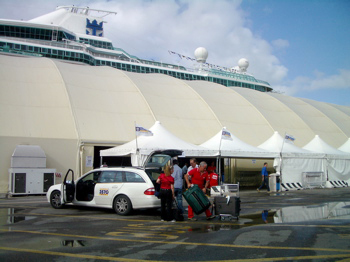 At the Cruise Terminal, you will check in at Royal Caribbean. 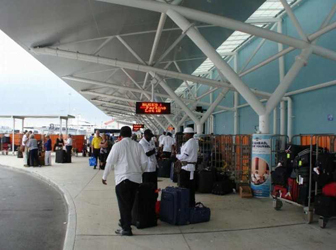 Please expect delays related to security and immigration procedures when arriving at the Cruise Terminal to board the ship. These procedures have been designed for your safety and all attempts will be made to expedite you through the process as quickly as possible. Be sure to arrive at the Cruise Port well in advance of the ship's departure. Look for a sign directing you to your Deck. 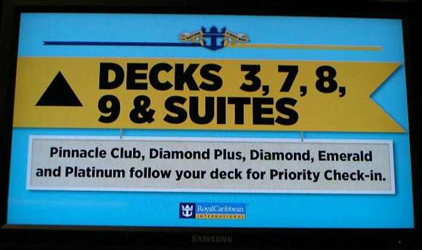 If you are booked in a suite, or if you are an Emerald, Platinum, Diamond or Diamond Plus member of the Royal Caribbean Crown & Anchor Society, be sure to take advantage of Priority Check-in. Look for a sign directing you to your Deck and to Priority Check-In. That is the area where you can go ahead of the long lines. If you have completed your online registration in advance and printed out your "SetSail" Boarding Pass, then you will "sail through" the registration process. If not, please arrive early, by 2:00 pm, in order to complete your registration. You can complete Online Check-In (on the Internet) no later than 4 days prior to the cruise. If you completed Online Check-In, you will go to an area designated for documentation validation. By checking in online, you will expedite your boarding process and will be able to start enjoying your cruise vacation much faster. Check-in online in advance! It's easy. When you check-in online, it saves time. You won't have to fill out any forms at the port. Once you have completed the Online Check-In process, you will receive a "SetSail" Pass, which indicates you successfully completed the check-in process for you and other guests listed on your SetSail Pass. IMPORTANT: You must complete and print your SetSail Pass 4 days prior to your sail date. TIP: For security purposes, the system will time-out after 30 minutes even while there is activity, so make sure you gather everything listed above before you begin. NEED HELP? For computer tech support, call this number: (800) 398-9819. They will walk you through the process. LUGGAGE TAGS: After you have completed your SetSail Pass, you will print out luggage tags marked with your stateroom number. These will automatically direct all your luggage from the place the porter takes your luggage at the port directly to your stateroom. 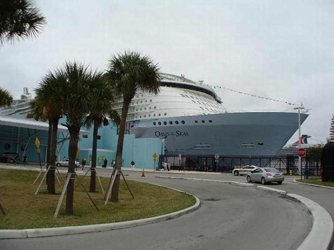 Once this is complete, you are all set and ready to enjoy your cruise onboard Royal Caribbean. Just make sure you take your boarding pass, luggage tags, and necessary documentation (passport, visas, etc.) to the pier with you. WHAT IS THE ROYAL CARIBBEAN SEAPASS ACCOUNT? One of the best things about cruising with Royal Caribbean is the convenience of being able to sign for all your expenses and have them charged to your stateroom. When you check-in for your cruise, you'll receive a SeaPass Card. The Cruise Card is used to access your personal shipboard account to which all purchases are charged. All of Royal Caribbean ships operate on a "cashless" system, meaning your boarding card, (also known as your Royal Caribbean SeaPass card), will be used as a charge card to make all onboard purchases. To activate this Royal Caribbean SeaPass account, most guests provide a credit card, (American Express, Optima, MasterCard, Visa, Discover and Diner's Club), to have these purchases charged at the end of their cruise. Additionally, the Royal Caribbean SeaPass system may be activated with traveler's checks, debit cards with a Visa or MasterCard logo, or cash. A running tab of all your purchases will be kept under separate folio numbers for each guest and an itemized statement left in your stateroom the night before disembarkation. If you provided a credit card and there are no discrepancies, the amount will be charged to your account on the morning of disembarkation. If you have used traveler's checks or cash to activate the account, you will need to settle the account at the Guest Relations desk, to either receive a reimbursement of the unused amount, or to pay the balance due. Royal Caribbean Cruise Line uses a computerized system for tracking all persons, both guests and crew, who enter and exit the ship. Upon arrival at the ship, each guest is issued a boarding card (Royal Caribbean SeaPass) which they must swipe to be officially logged on to the ship. The system imbeds a full color, digital photograph together with personal database information on their SeaPass. With a card swipe, a computer displays a corresponding photo with database information and merges time and date tracking information upon entry or exit. Your SeaPass Card will serve as your boarding card. This card identifies you as a Royal Caribbean guest and must be carried with you along with picture identification when you go ashore. Because the ship is closed to the public while docked at the various ports-of-call, you must show your SeaPass Card and picture I.D. to the officer on duty in order to return on board. If you or one of the kids has trouble keeping track of that SeaPass card, go to the shops onboard and buy a plastic holder with a lanyard. Place the card inside the plastic holder and you are good to go. For extra security, stop by the Guest Relations Desk and get a hole punched in the card to slip through the security ring that attaches to the lanyard. As a "From Delphi to Atlantis with Mas" Seminar-at-Sea attendee, your incredibly low fee of a total $13.50 or $15.95 (for suites) per day, per person, for service charges (tips) to your steward, waiters, and all other onboard staff was ALREADY PREPAID when you registered for the event. This gratuity is shared by your stateroom attendant, dining services staff, and housekeeping staff members who help enhance your vacation experience. At your discretion, the gratuity payments may be adjusted onboard at Guest Relations, in which case they will not automatically be added to your onboard SeaPass account. A 15% gratuity will be automatically added to all beverages, mini bar purchases, spa and salon services. Additional gratuities may be added at your discretion. On our "From Delphi to Atlantis with Mas" Seminar-at-Sea, Mas will bring books, CDs, DVDs, and other products. He will also offer private and semi-private sessions. He will be selling his wares in the meeting room in the Conference Center on the ship. Those special items can be purchased with cash or a credit card and will not go through the Royal Caribbean SeaPass account system. If you get short on cash, all ships in the Royal Caribbean fleet have ATM machines. There is a transaction fee levied by the owners of the ATMs, plus any other fees your financial institution would charge. Make sure you keep one bag that you hand-carry onto the ship. Upon arrival at the dock, your luggage will be carried onto the ship by porters and delivered to your stateroom, and you will not see it again for several hours. You might not see that luggage until late that night. Therefore, pack a carry-on that you can wheel onto the ship with all you need for the day, including your travel documents, change of clothing, swim suit, workout clothes, cosmetics, medicines, book to read, and/or anything else you might want. As soon as you get onboard, go straight to your stateroom and get settled, if your room is ready. There you will find the "Cruise Compass" Newsletter with schedules for all the onboard activities, including a Tour of the Jewel of the Seas with the Cruise Staff. If your room isn't ready yet, then head for one of the dining rooms onboard for lunch. If the spa or fitness classes are your thing, make your appointments on the first day, as the most popular treatments and times fill up fast. Shortly after you are welcomed aboard your incredibly beautiful Royal Caribbean ship, you're invited to relax and dine at any of the following free restaurants: Windjammer Café for Buffet (Deck 11 Aft) and Latte-tudes for Snacks (Deck 5 Midship). Other free dining rooms will be closed for lunch on embarkation day. Read the details in your "Cruise Compass" Newsletter, which you will find in your room or at Guest Services, as the dining information here might be out of date due to frequent Dry Dock renovations to the ship. Royal Caribbean's unique combination of gracious dining staff, fine cuisine, and new friends make every meal onboard a memorable occasion, starting from the moment you get on the ship. ALL attendees of the "From Delphi to Atlantis with Mas" Seminar-at-Sea are required to check-in, right after you board the ship, for the Seminar-at-Sea on Deck 5 Forward in The Conference Center, from 2:30 pm to 3:30 pm. During your check-in, you will receive your cruise and seminar guide and your unique seminar entrance identifier so you can get into our seminars. Security on the seminar will be strict, and you will not be allowed into any events without your unique identification. Also, if you are attending one of our special Seminar-at-Sea shore excursions, you will receive your shore excursion tickets at this mandatory check-in. The first meeting of our Seminar-at-Sea will take place in the Conference Center, Deck 5 Forward, from 5:00 to 5:45 pm. See the entire TENTATIVE schedule at www.divinetravels.com/GreeceCruise2017Schedule.html. At 5:45 pm, right after our first meeting, we will meet for a Group Photo in the Conference Center, Deck 5 Forward. Dinner will begin at 6:00 pm in the main dining room. Our group will have a designated place to dine together nightly from 6:00 to 8:00 pm. Make new friends at dinner, or dine with your favorite speakers! Please note that you can eat anywhere you want within that general designated seating area. Even though your "SeaPass Card" will have a table-number printed on it, your table is NOT really assigned, so please move around and meet new people for each meal. Please arrive on time in order to get a spot. Otherwise empty tables might be relinquished to general seating. Of course, you are not required to eat with our group, or in our dining room. There are several places to eat anytime on the ship, including a giant buffet and FREE room service. See details of dining choices listed in the Cruise Compass when you get onboard. Due to the uncertainties of air travel, we highly recommend that you arrive for your cruise the night before, on October 15, 2017, and stay at a hotel in Rome. To make a reservation, contact Adele at Legendary World Travel: 760-230-5624. Royal Caribbean's ChoiceAir program has been enhanced with Premium Benefits that give you everything you want in airfare service: the best value, the assurance that you'll get to your ship, the flexibility to choose your favorite airline and flights, and the security in knowing you have round-the-clock support throughout your travels. - We guarantee the lowest airfare available. If you find a lower fare within 24 hours of booking, we'll award you 110% of the difference to spend on board your cruise—a benefit no other cruise line offers. - We have experts on hand monitoring your flights, and if any delays or cancellations jeopardize your travel plans, we work quickly with the airline to get you on the next available flight to get you to your ship. - You have the flexibility to search different airlines and flights, so it's easy to find exactly what you want. And, we save you time by filtering out flights that won't work with your cruise. - We have Royal Caribbean Air Agents available 24/7 to help ensure you air travel is as carefree as your cruise. Just call. They'll do whatever they can to help. - Royal Caribbean's ChoiceAir with all its benefits and services is absolutely free to use. All you pay for is your air travel, which is exactly the way it should be. - For additional details about the Royal Caribbean ChoiceAir program, contact Adele at Legendary World Travel: 760-230-5624 after you have made a reservation for the Cruise. 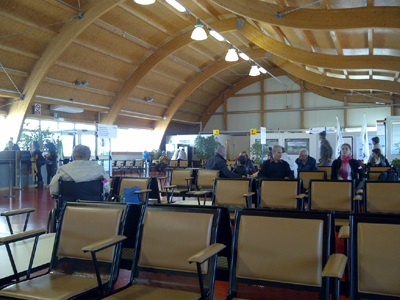 Air travel schedules can be affected by a number of factors. If your flight arrives at your ship's home port after the ship's scheduled sailing time due to weather or mechanical problems, contact Royal Caribbean's emergency travel hotline and/or a supervisor at the airline's ticket counter for assistance in securing hotel accommodations and flight arrangements to your ship's next destination. In case you miss the departure of your ship due to carrier-caused delays or other covered reasons, please make sure you have enough travel insurance to cover additional accommodations, meals and "catch-up" transportation expenses. You are responsible for any expense incurred to meet the ship at its next port of call. For this reason, we highly recommend that you arrive a day prior to sailing and stay in a hotel the night before to avoid any possible delays. We offer pre-cruise hotel reservations and we offer travel insurance. Contact Adele at Legendary World Travel: 760-230-5624. You should dress for a cruise with Royal Caribbean the same way you would for any stylish land-based resort. Casual sportswear, including shorts, lightweight pants and jogging suits, is the order of the day both at sea and ashore in hotter climates. We recommend you bring a sweater, a jacket or an all-weather coat for cool evenings, and for shore excursions, depending on your destination. Due to unpredictable weather, don't forget a hat or visor and a collapsible umbrella. Please be sure to bring proper clothing for visits to religious sites. You'll also want low-heeled, rubbersoled shoes for strolling on deck, as well as comfortable walking shoes or sandals to wear. Royal Caribbean makes it easy to know what to pack and what to wear when you're dining onboard our spectacular ships. There are two designations for dress codes: Smart Casual and Formal. Passenger attire should be in keeping with what they would wear to a nice restaurant at home. When formal nights are held, please observe the dress code in the Traditional Dining and Anytime Dining venues for the enjoyment of all our guests. Royal Caribbean offers formal wear rental on all cruises; this can be arranged prior to embarkation. Dress with an elegance and style that is perfect for all the formal activities on your cruise with Royal Caribbean. Cruiseline Formal Wear delivers beautifully-tailored clothing directly to your stateroom. To order your formal wear, please visit http://cruiselineformal.com, call 800-551-5091 or 305-252-8572. For questions, email: custservice@cruiselineformal.com. Many domestic airline carriers now impose excess baggage fees for one or more bags and bags weighing over 50 lbs., so check with your carrier regarding weight restrictions. All luggage should have a sturdy personal identification tag that will not be lost or damaged in the course of typical airport and trucked luggage handling. On journeys including air travel, luggage will be subject to a considerable amount of handling and we would recommend that your luggage be of sturdy construction. Royal Caribbean recommends that your travel protection insurance should be adequate enough to cover any possible loss or damage that may occur. Any loss or damage caused by Royal Caribbean or an airline must be reported immediately to the responsible party. Royal Caribbean will make every effort to assist you in safeguarding your belongings. But remember, you are responsible for your possessions at all times. Royal Caribbean is not responsible for money, jewelry, cameras, binoculars, documents or any other articles you retain in your personal control. We strongly recommend you hand-carry all valuables and breakables, including jewelry, electronics and cameras, essential medications, travel documents, valuables, and breakables should be hand carried in your possession at all times. Please read the Passage Contract for limitations and responsibilities for lost items and baggage. yoga mat, rain poncho, rain footwear, warm clothing for viewing UFO Starwatches after sunset on the outside deck, nice clothes for dinner, dressy or formal clothes for dinner on two formal night on 7-day cruise, long pants and tops, sweatshirt and sweatpants, warm jacket or windbreaker, sweater or shawl for air conditioned ship, sundress, shorts, t-shirts, tanks, underwear, socks, sleeping-clothes, walking shoes, sandals or flip-flops, 2 bathing suits and cover-up, sunscreen, watch (your phone won't work as a watch), alarm clock (or ask for wake-up call from ship Operator), cosmetics, toiletries, bar soap (optional), medications, sunglasses, eyeglasses or contacts, hat or visor, camera, laptop or notebook computer (Wi-Fi is available on the ship for a fee) with chargers, extra batteries, backpack or fanny pack for day excursions, binoculars, post-it notes and pens (to leave notes on your door or for your cabin attendant), book to read, journal, notebook, backpack or fanny pack. - Bring shirts and pants/skirts that mix and match, turning three outfits into five or six. - Wear your heaviest shoes during embarkation and disembarkation so you don't have to pack them. - Pack small items inside larger ones for efficiency. - Bring an additional empty collabsible bag for those acquired extras. You'll need comfortable walking shoes, as well as a hat or umbrella and sunscreen for protection from the sun. If you'll be touring any museums, cathedrals or churches, it's always wise to dress conservatively. In the unlikely event of rain, you may want to bring a poncho, raincoat, or travel umbrella. Each guest is permitted to carry a reasonable amount of personal property (including luggage) aboard the vessel; however, for your comfort and convenience, it is recommended that you limit the number of pieces you take. Keep in mind that airlines may charge for excess or oversize luggage. 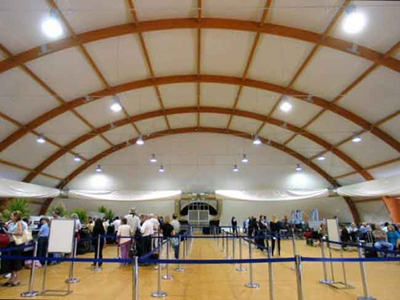 Charges incurred for excess or oversize baggage are the sole responsibility of the passenger. Each airline has a different limit on the amount of luggage they allow. Check with your air carrier for specific restrictions, such as allowance of pounds and any additional charges. For the safety of our guests and crew there are certain items that are not allowed onboard. If these are found they will be confiscated. Alcoholic beverages, illegal drugs, flammable liquids, explosives, and dangerous chemicals will not be returned. Weapons, illegal drugs, and other items that could interfere with the safe operation of the ship or the safe and secure environment of our guests and crew are prohibited. Do not pack fragile or expensive items (such as jewelry) in checked luggage. - Illegal Drugs & Substances. If you sneak Marijuana or other illegal drugs onboard, you will be arrested. Each passenger is responsible for providing Royal Caribbean Cruises with complete and accurate immigration information. The Passenger Immigration Form (PIF) should be completed online using Cruise Personalizer. Ensure your name appears exactly as shown on your travel document. If the name does not match, contact your travel agent (the travel agent must call in corrections). Please provide Royal Caribbean Cruises with the correct information at least 45 days prior to your cruise. Failure to do so will result in delayed check-in and, possibly, denied boarding. Travel Document requirements vary by destination and your citizenship. Below are document guidelines for both domestic and international voyages. Once a booking is made, you may view voyage specific requirements on the Cruise Personalizer. A valid passport for all adults and children is required for all international itineraries. Therefore, for the Greek Isles Cruises, Royal Caribbean requires that all passengers must be in possession of a valid passport. If your cruise requires international air travel, you will be required to present a valid passport when departing from or returning to your home country by air. Failure to present a valid passport for any passenger will result in denial of boarding without refund of the cruise fare. IMPORTANT: Visa and documentation requirements vary by destination and change from time to time without prior notice. Passengers should check with the consulate of each country they will visit (Greece, Turkey, and Italy), or a visa service to verify current regulations. It is the passenger's responsibility to have proper travel documentation. They should reconfirm visa requirements with the consulate 14-30 days prior to the cruise. Many countries require passports be valid for six months after the completion of your travel. Check your passport to verify it will be valid for this period of time. Please ensure the name on the passport matches the name on the booking. Additionally, make certain that your passport contains blank pages for entry and exit endorsements and any visas that may be required. If necessary, allow sufficient time to renew your passport and/or obtain additional pages. Passport holders should ensure passports are valid through the completion of travel. There may be occasions where Royal Caribbean will retain your passport at check-in. This is to ensure that you are not inconvenienced by immigration clearance during your cruise and where face to face inspection is not required. We recommend you bring a second government issued photo ID if you wish to have one with you while in port. There are over 7,000 Application Acceptance locations in the US. Callers may locate the one closest to them by going to the US Department of State website at http://iafdb.travel.state.gov. The United States Postal Service also provides passport services. To obtain this information, go to usps.com to find a Post Office location, fees, and to download a passport application at http://www.usps.com/passport. For information regarding Passport applications, please visit: http://travel.state.gov/passport/passport_1738.html or call the National Passport Information Center at 877-487-2778 (M-F, 5am to 5pm Pacific Time). *This information is provided as general guidance. Because governmental travel requirements change periodically, you must check with your travel agent or the government authorities for all countries you will visit to determine or verify the actual requirements at the time of sailing. Royal Caribbean assumes no responsibility for advising passengers of such requirements. Information regarding required vaccinations for your cruise is listed on your Travel Summary (if applicable). We recommend seasonal influenza vaccinations for all passengers. Furthermore, you are strongly urged to seek advice from your primary care physician or an approved public health advisory service to identify any specific vaccination or health precautions required for each port of call. Vaccination requirements vary by destination and change from time to time. Passengers should check with the World Health Organization (WHO) (http://who.int/ith) or contact the United States Centers for Disease Control and Prevention (CDC) at www.cdc.gov/travel to verify current regulations. Norovirus is the most common cause of gastroenteritis in the developed world. The health and well-being of our passengers and crew is our highest priority. There are several measures which have been placed to prevent and contain illnesses on our ships that meet or exceed standards set by the U.S. Centers for Disease Control and Prevention. The simplest way for you to stay healthy is to frequently and thoroughly wash your hands with soap and water, especially before eating and after using the toilet. You'll also find hand sanitizers located throughout the ship for your use after washing your hands. If you feel ill during your voyage, please immediately report to the medical center. We strongly recommend you review your health insurance coverage before cruising. Many policies, including Medicare, will not pay for services or hospitalization outside of the country or for emergency evacuation. Royal Caribbean Cruises ships are foreign-flagged and are considered "out of country." Please contact Adele at Legendary World Travel: 760-230-5624,to arrange for insurance. For the comfort and enjoyment of our guests, our ships are designated as non-smoking; however, we recognize that some of our guests do smoke. Therefore, to provide an onboard environment that also satisfies smokers, we have designated certain areas of the ship as smoking areas. Cigarette, cigar, e-cigarette and pipe smoking is permitted in designated outdoor areas of the starboard side of all ships; with the exception of Freedom-class ships that will allow smoking on the port side of the ships. To assist in locating areas where smoking is permitted, guests will find visible signage posted within all smoking areas and ashtrays that are provided for use. Outdoor areas near restricted areas, food venues, and kids play areas and pools will not allow smoking. On Freedom class, smoking is not permitted in Central Park or the Boardwalk neighborhoods. Smoking is not permitted inside any stateroom and any stateroom balcony. This applies to all stateroom categories onboard. If a guest is in violation of this stateroom policy, a cleaning fee of $250 USD will be applied to their SeaPass account and may be subject to further action pursuant to the "Consequences Section" of the Guest Conduct Policy. Guests who violate this smoking policy may be subject to further action pursuant to the "Consequences Section" of the Guest Conduct Policy. Passengers under the age of 21 years must travel in a stateroom with a passenger 21 years or older who shall assume responsibility for their care during the cruise. For family groups booking multiple staterooms, the minimum age for each stateroom is 16 years of age, provided they are traveling with a parent or legal guardian. Each passenger agrees and warrants that he/she will supervise any passenger in his/her care at all times to ensure all policies, along with all other rules of the Carrier and ship, are strictly adhered to by all passengers under their supervision. Passengers under the age of 18 are prohibited from purchasing cigarettes or tobacco products while on board. Children under 3 are not permitted in the Fun Factory Kid's Center unless accompanied by a parent at all times. Youth Center staff cannot administer medication, bottle-feed, change diapers, or provide meal service. All children participating in the Youth program must be potty-trained. Children who are not potty-trained are not permitted in hot tub or pool facilities. For more information about the Fun Factory, see www.divinetravels.com/Royal CaribbeanInfinityShip.html. Royal Caribbean welcomes all children and teens ages 3-17 to participate in our programs. Let our staff know of all medical and/or special needs for your children. We will make every effort to accommodate them. Please be advised that Royal Caribbean Youth staff do not offer individual one-on-one supervision. Pregnant women are not allowed to sail if they are entering the 24th week of their pregnancy by the last day of the cruise. All pregnant women are required to produce a physician's letter stating that mother and baby are in good health, fit to travel and the pregnancy is not high risk. The letter must also include the estimated date of delivery (EDD) calculated from both Last Menstrual Period (LMP) and ultrasound (if performed). Please fax your physician letter to the Fleet Medical Department confidential fax at (661) 753-0121. For more information contact our Access Department at (866) 592-7225 (voice), fax (954) 628-9622, send an e-mail to special_needs@rccl.com, or contact our local Travel Agent Adele at 760-230-5624. For additional assistance, feel free to ask for a Complaint Resolution Official (CRO). Our CROs have been trained and are aware of the applicable U.S. Department of Transportation (DOT) disability regulations as well as our policies and procedures regarding guests with disabilities. They will be glad to respond to your concerns. Our CROs are available at all U.S. port of departure and all of our ships. The goal of Royal Caribbean Cruises is to provide a safe comfortable cruise experience for all passengers. If you will be using a mobility device during your sailing we strongly recommend you travel with a person physically fit to assist with your needs both onboard and ashore. Embarking and disembarking can be challenging for those with limited mobility. Many major ports of call provide easy access for wheelchairs and scooters. However due to various conditions; steepness of the gangway, weather, shore-side facilities, tidal and sea conditions, passengers using mobility devices may be required to transfer to a stair climber or be precluded from going ashore. Royal Caribbean staff will make every effort to assist but are not allowed to individually physically lift more than 50 pounds (22 kg). If passengers are unable to tender or disembark because of circumstances outlined above there will be no refund or credit for missed ports. While Royal Caribbean recognizes your disappointment, the safety of both passengers and crew takes precedence.